I’m very fussy with my headphones and I’ve always been disappointed with the sound quality and volume with the many I’ve tried, until I was sent these new marvels from Radiopaq. At £50 I’m not sure I would have looked twice at these headphones (yes I may be fussy but I’m also a bargain hunter) after all, they aren’t Sony or Sennheiser. 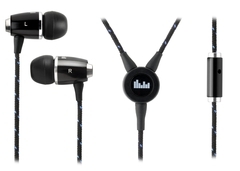 The earphones, which have been made to work with the iPhone come in four different profiles to suit your music taste. These include rock, pop, classical and Jazz and each type is tuned to give the best possible sound for each genre. Being a queen of cheese I chose pop, which are claimed to have a more dynamic, sharp listening experience with strong vocals and a great beat. And I can’t fault these claims here. The sound was spot on. So much so, at times I actually thought I was at an actual Take That concert. Because the earphones are made for the iPhone they also have an inline remote and microphone, which lets users answer phone calls quickly and easily, even when listening to music. Again, I’ve always been quite skeptical about such claims but these headphones were perfect. My music was paused when the phone rang and I could hear people as clearly as they could hear me when I spoke through the microphone. The headphones also fit really nicely into my ears, and just to make sure they were just as comfortable on others, I asked a few people to try them out. General consensus was that they were much more comfortable than a standard earphone. However, I do have one tiny complaint and that’s the wiring. It could just be personal preference but I like my wires subtle and plain and these headphones were anything but that with black and red coated wiring, which really makes them stand out. However, this is a minor qualm for such a perfect set of cans.